I'll admit I enjoyed the Beijing Games far more than I expected to. Of course the swimming, diving, track and gymnastics were extraordinary, and it was nice to briefly get wrapped up in something outside my usual focus. But as someone who is fascinated by China's artistic tradition, I also appreciated the Olympic venue and accompanying news coverage. If you too are experiencing a little withdrawal, here is a small fix: a glance at classical Chinese carpets and rugs. Details mostly, from Hali, January-February 2006. According to Hali, specially made pile carpets covered the floors of the main halls within the Forbidden City during 500-plus years of Imperial rule. (Construction began in Beijing in 1421.) Today fewer than 600 of the classical Chinese carpets and fragments survive. As with most things Chinese, the geometric and stylized animal motifs were rich with symbolism. The endless network of fret patterns (sort of lattice-like) that you see in most of the examples here are composed of "wan zi" symbols which represent the number 10,000 and a wish for longevity. Contemporary textile designers seem to be heavily influenced by these traditional Chinese geometrics. If you look quite closely at this detail from a Mary McDonald-designed bedroom (image via House Beautiful) you may notice a Chinese-style carpet in yellow and cream. 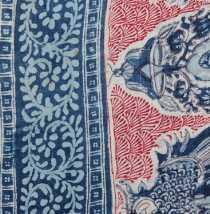 Shown at top are details from four 17th-century Ningxia carpets. 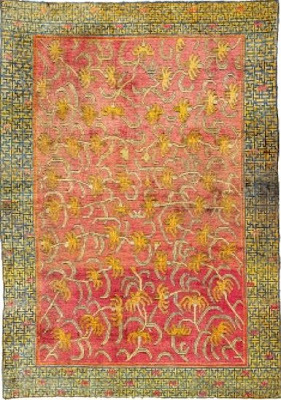 Second is an 18th-century Xinjiang all-silk rug with yellow lilies. 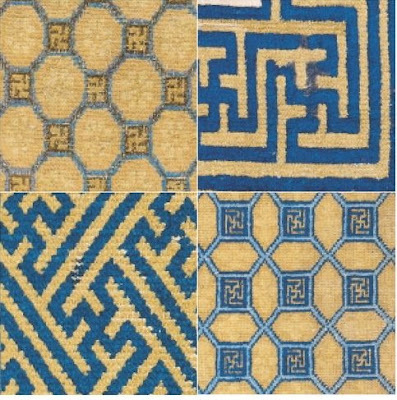 Third, details from Imperial palace carpets show the clarity of the drawing and the precision of the Chinese knotting. 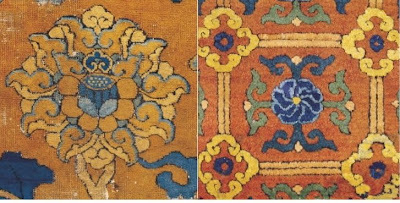 Fourth, fretwork medallions in 17th-century Ningxia carpets. Above, a bonus: Quing Imperial yellow embroidered panel for a nine-fold screen. 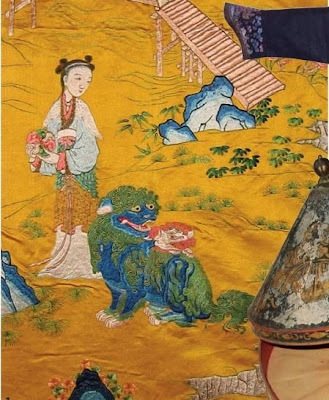 Imagery includes fu dog and female deities in the heavenly garden. 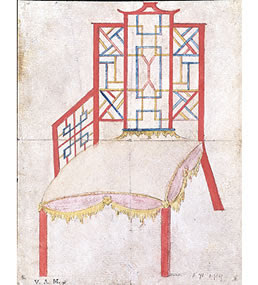 18th-century Chinese. Hali, winter 2007. I think many of you have seen South of Market featured in magazines including House Beautiful, Atlanta Homes & Lifestyles and Southern Accents, and you probably know about the shop's Peachtree Hills location, but there is another Atlanta spot at 1044 North Highland Ave. that is filled to the brim with stylishly laid-back furnishings. Case in point: these lovely pillows. South of Market offers many investment-worthy pillows made up in a variety of trade-only fabrics. Sometimes when you are head-over-heels for a certain pricey print and using it for curtains or an entire sofa is cost prohibitive, pillows can be an alternative. If I remember correctly, in a chic "high-low" apartment, Joe Nye once used pillows that cost more than his client's chain store sofa. 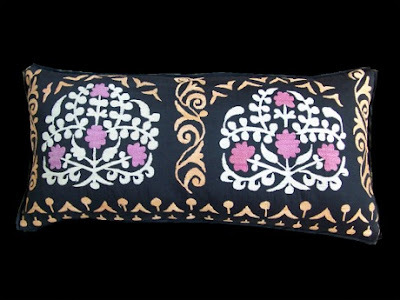 Speaking of investment pillows, Louisiana-based textile collector and designer, Rebecca Vizard, is currently offering a vintage suzani piece in the most unexpected colors -- lavender, off white and pumpkin on a black cotton ground. 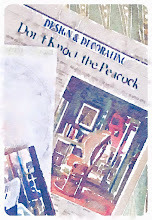 Click here for a peek at Vizard's studio. After Janet mentioned to me that Emily Eerdmans, author of the upcoming Regency Redux, was one of her Attingham classmates, I read a bit more about the institution. Begun in 1952, this charitable educational trust offers focused studies of English country houses. The courses are designed primarily for curators and other professionals, but I think a wide audience will enjoy browsing the Attingham site. The list of links to celebrated country homes, like Nancy Lancaster's Kelmarsh, is outstanding. In fact I've added Attingham to the resource list here in the blog's right hand sidebar. BTW: Jennifer gave us a wonderful preview of Eerdmans' book a while back. 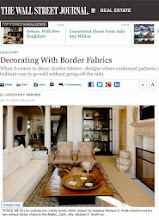 One thing I've missed since the demise of House & Garden is the monthly "Fabric Obsession" piece with Carolina Irving. The images were were always lush and the text informative. 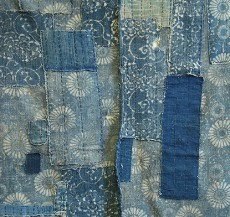 For those of you who are also passionate about textiles, I offer a very mini fabric fix. These examples belong to noted Italian collector Giuseppe Moreschini. 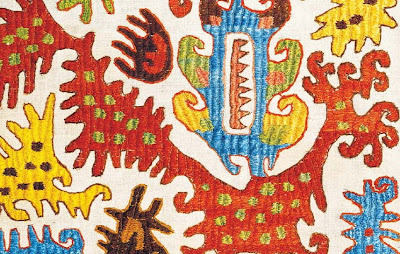 For textile connoisseurs, it is the rarity (only about five to six hundred are believed to be around today) of the embroideries combined with the mysterious imagery and vibrant hues that make them so alluring. 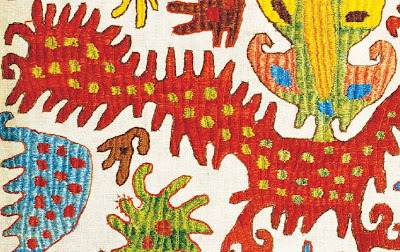 According to Hali, Kaitag textiles were only discovered by those outside the region in the early 1990s. 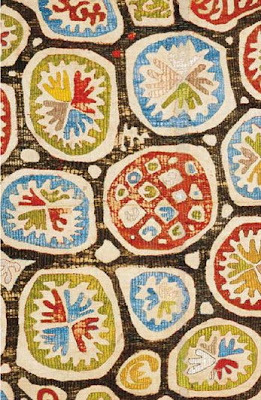 At the moment I can't identify the fabric used on Steven Sclaroff's vintage Louis-XV-style chair, but the print reminds me of Paule Marrot. 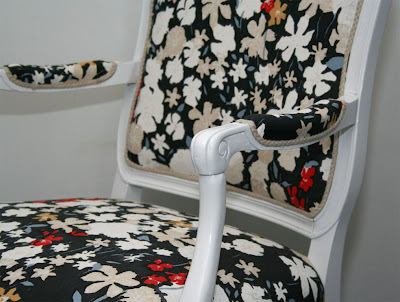 French-born Marrot is a key name in 20th-century textile design who redefined furnishing fabrics in her native country. Best known for her flattened out, upbeat florals that are a bit similar to the work of Fauve painter, Raoul Dufy, she became popular in the U.S. after World War II. Billy Baldwin had a penchant for bright, painterly flowers on clean cotton, so he was a big Marrot fan. And her fabrics made their way into Jackie O's home. Above are pages from Irving's 2005 H & G story about Marrot. 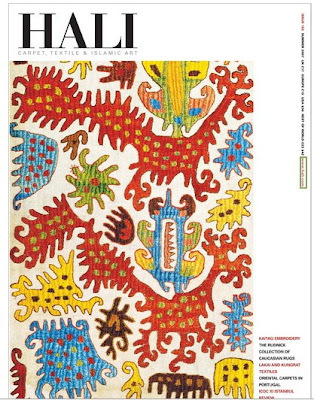 In 1997 The Museum of Printed Textiles held a retrospective of Marrot's work. Gotheborg now features a list of the one hundred best books on Chinese porcelain, as well as recommended reading in specific categories such as Blanc de Chine. For example, P.J. Donnelly's title is from 1969 and covers white porcelain from the Dehua kilns in Fujian province. It is said to be a classic. Gotheborg suggests pairing it with newer books that deal with current findings. 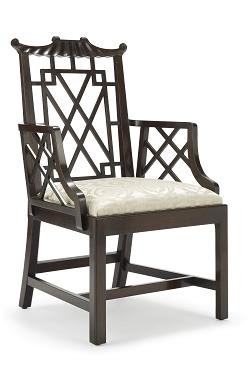 Speaking of Asian inspiration, here is the latest from Michael Smith, the Kent chair. It reminds me so much of William and John Linnell's 18th-century piece posted here before. Linnell image courtesy the V & A. 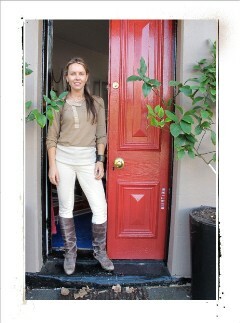 Plenty of designers see animal-prints as neutrals. Charleston-based Amelia Handegan is among them but uses these patterns in a supremely refined way. She seems to favor jaguar-print chairs and in the September-October Southern Accents she says they "go with everything." I always enjoy how Handegan punctuates her classic interiors with small doses of the irregular spots. The Handegan-designed home that appears in SA's latest issue has caused me to eat my words about full silver services not appearing in magazines anymore; an exquisite French turn-of-the-century version is prominently displayed in the King Street dining room. Note how the absence of a rug highlights the beauty of the black chinoiserie chairs and keeps the room's formality in check. It's typical of Handegan to keep things from getting fussy. Even with the arrangement shown at top she eschews flowers in favor of all-green foliage to show off a special silver vase. Not too long ago I was in a kitchen with pink walls and a checkerboard floor. The homeowner mentioned that the room had not been touched since the 80s and I said, "Well, you know the look is back." So, as proof, I offer this image from C Magazine, April 2008. I'm sure you recognize Windsor Smith (note the tall black boots, one of our all-time good things from yesterday's post). Smith offered three different takes on a classic entry. The first entry obviously has a more glamorous, California Regency feel with crisp graphic contrasts but the second is decidedly English Country. I was excited to see the latter because I always like Windsor's spin on this layered, effortless look. 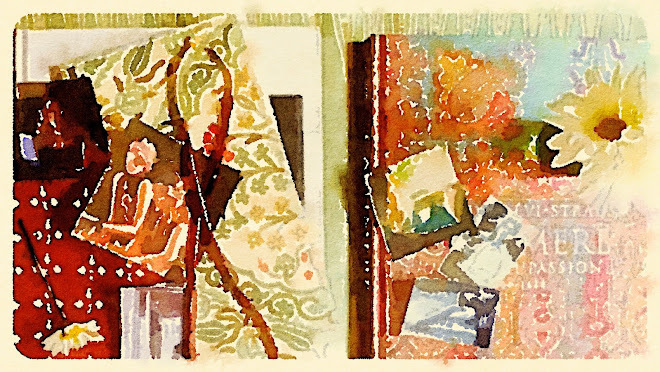 Here she's used a Hovey-esque leather sofa (another "good thing") and a mix of traditional paintings hung gallery style. 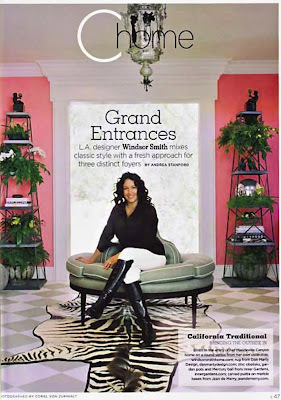 Nearly every shelter magazine does some variation on "things we love" (features with iconic furnishings or accessories) and of course Martha Stewart has her Good Things. 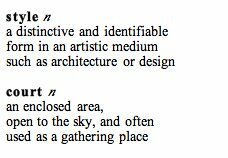 So, I won't pretend this blog post is completely original; this run-down no doubt includes elements you are very familiar with. But that's sort of the point. 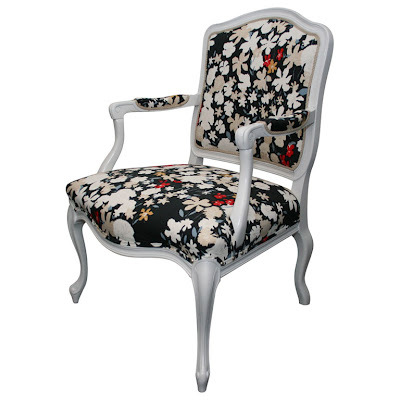 Last week Mrs. Blandings shared a striking image of her classic chair. 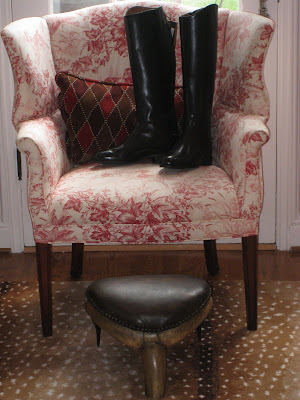 With one strong vignette she captured multiple good things: tall black boots, animal print carpets, chic leather foot stools, timeless red-and-white prints, and gutsy sinuous wing chairs. Her picture promptly made its way to my mirror. Mrs. Blandings' aesthetic, like her idol Steven Gambrel's, is quintessentially American but the layers shown at top also remind me of the Herrera women and their Old World passion for toile. 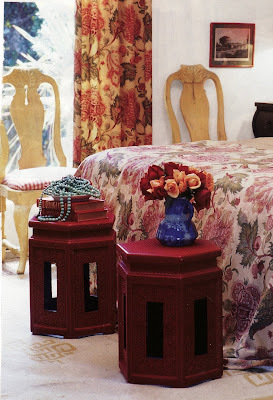 In particular, Mrs. Blandings' mix of the feminine red-and-white fabric with more masculine animal-related elements reminds me of Carolina Jr.'s estancia as seen in the 2008 fall/winter issue of Vogue Living. 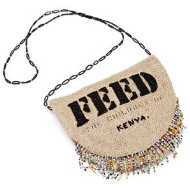 And this brings me to another great thing: inspiration boards. 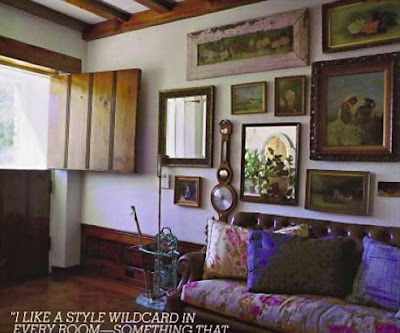 I would buy a book filled only with inspiration boards put together by my favorite tastemakers. Let's take a closer look at Carolina Jr.'s. Tufted leather sofas also make the list of domestic icons. I love Hollister Hovey's below. Simple, old fashioned children's toys, globes and oxford cloth shirts are more good things. 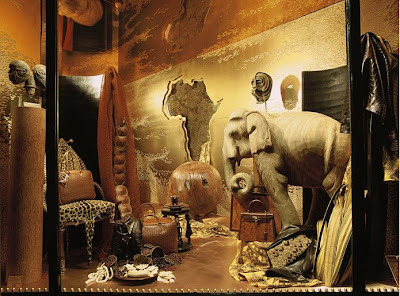 Here a Ralph Lauren display from a department store. 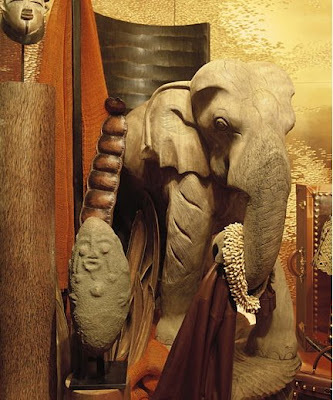 The world of Hermes is an endless source of inspiration. Below, a 1997 Paris vignette followed by last year's ad campaign. 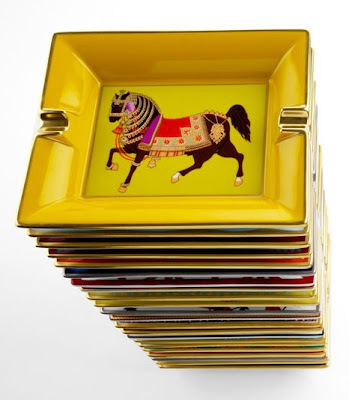 A wonderful way to bring a touch of Hermes into a room is to use one of their chic, colorful ashtrays for keys or other loose ends. These, unfortunately, are not inexpensive. 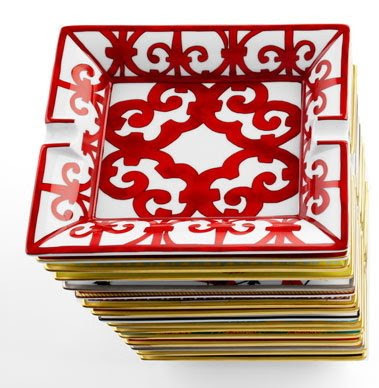 An alternative is to copy Rubie Green founder, Michelle Adams, and use a small plate or saucer with the Hermes pattern Balcon du Guadalquivir. (Click here or here to see the pattern used elsewhere.) When it comes to styling a room with layers of meaning, Michelle is an ace. 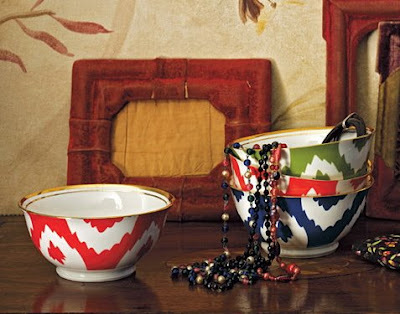 Anthropologie sells small bowls, just $14 each, with a different pattern but similar graphic appeal. 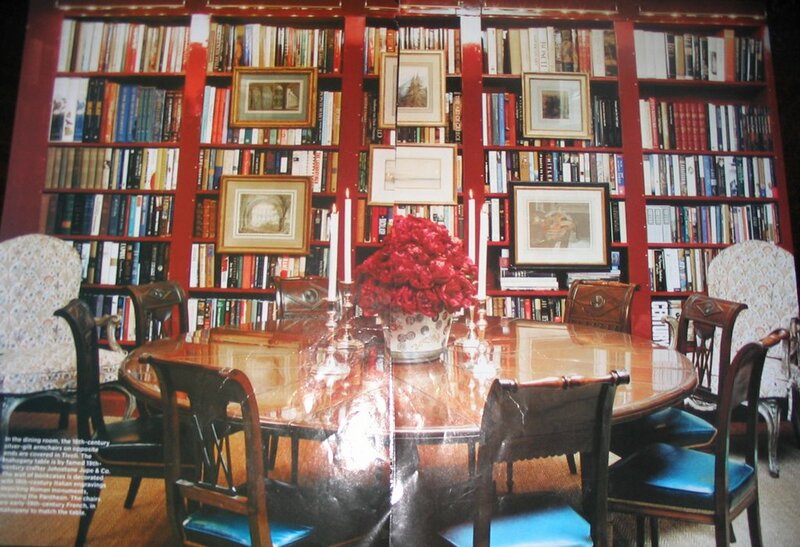 Library-dining or library-breakfast rooms are definitely good things. Below is Kaki Daniels', decorated by Suzanne Rheinstein, followed by Suzanne's own L.A. breakfast room. Note the black chinoiserie lantern, another icon, and more wing chairs. Illustrated children's books with crossover appeal for adults must be included too. Meg did a great post on artist Miroslav Sasek and his "This Is..." series. 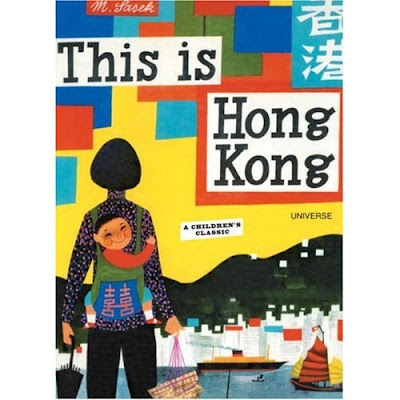 Right now the title This is Hong Kong, originally released in the mid-1960s, looks intriguing. 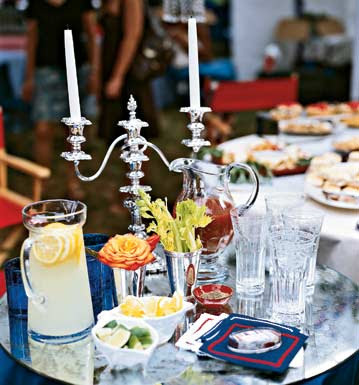 And a silver candelabra used outside. Tailgating season is just around the corner after all. Image courtesy Southern Accents. 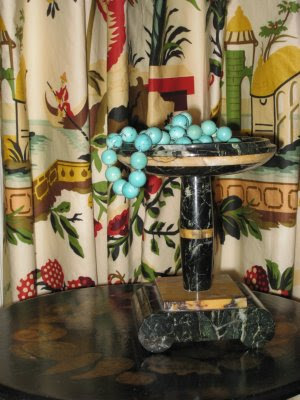 One more Blandings' item has to be here too: chunky Chinese turquoise beads.